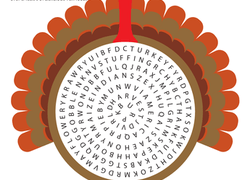 Get into the spirit of Thanksgiving with a fun puzzle! 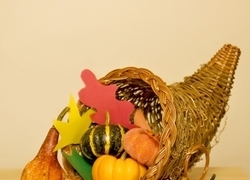 Our colorful worksheet will help your second grader build vocabulary as he learns about Thanksgiving. Cupcakes are extra fun when they're topped with festive acorns, fall leaves, pumpkins, and turkeys. Top them with these Fall cupcake picks! Got a grammar grumbler on your hands? 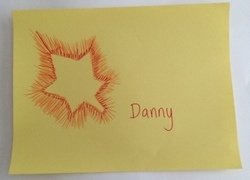 Give him a helpful worksheet on the use of nouns, with a Thanksgiving twist! 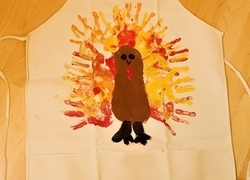 Help your child celebrate your family's Thanksgiving cook with this year two arts and crafts activity: make a "handy" painted apron! 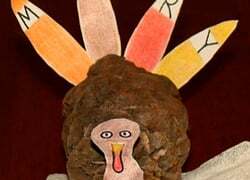 This Thanksgiving, make a pine cone turkey that can double as a personalized place setting for each family member. Need another reason to celebrate Thanksgiving? 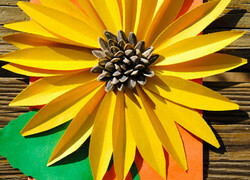 Now kids can create a sunny, textured sunflower card to remember the day! 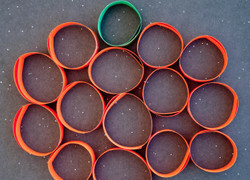 Inspired by the crispy, crunchy leaves of fall, this fanciful project is simple, easy and completely affordable. Now that's something to be thankful for!